1. Nella foto, da sinistra a destra: Vice Sindaco Piero Ottobrini, Sindaco Tiziano Teti, l’assessore alla cultura Carmine Ficca, Albert Porreca, uno dei due premiati, e Antonio Piccoli. Dan Aspromonte, l’altro premiato, era trattenuto in California, e quindi non poteva assistere alla cerimonia. Durante la premiazione il Sindaco ha telefonato a Dan per ringraziarlo personalmente. A causa del fuso orario, non si è riuscito a comunicare con lui, ma l’ha lasciato un messaggio di ringraziamento. Poi, Dan ha risposto con una lettera indirizzata ai cittadini di Torricella. Per leggere la lettera, cliccare qui. Torricella. The virtual community is born. 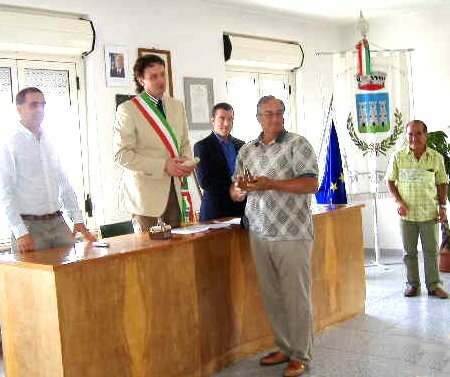 Torricella Peligna: The epilogue of the first edition of "The Week of Torricellans in the World" was an awards ceremony by Mayor Tiziano Teti to two emigrants who distinguished themselves by promoting the culture of the village together with knowledge about the middle Sangro Aventino's great potential. The prize winners are Albert Porreca and Dan Aspromonte who live respectively in New Jersey and California. Their merit was that a few years ago they created the website www.torricellapeligna.com which has enabled emigrants to meet each other within a sort of virtual community which unites them ever more closely: firstly with a forum group on "Yahoo" created by Edoardo Gentile and then when "The Week of Torricellans" was set up. This has brought many emigrants back to the village. In fact, you can hear many different languages being spoken in this small mountain center in these days by the emigrants who have returned from the Americas and from Northern Europe. 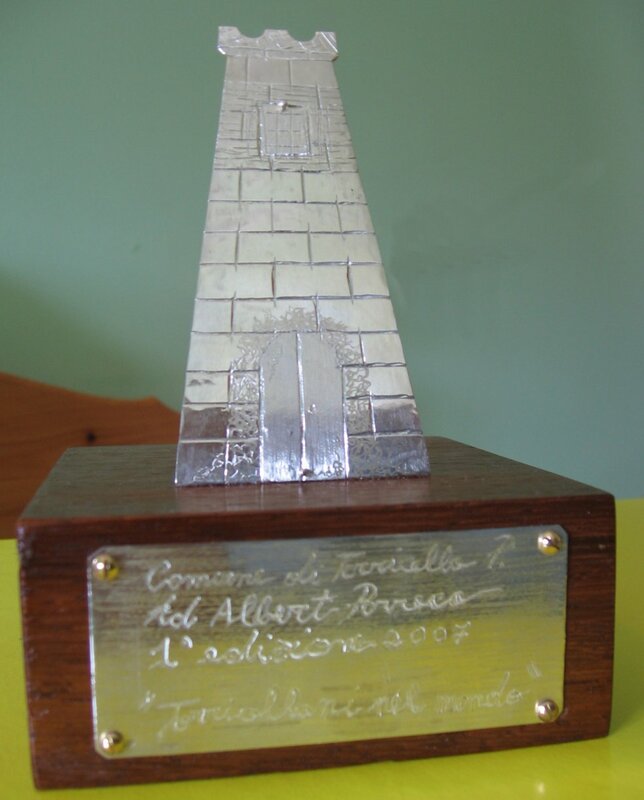 The first citizen gave the prizewinners a papyrus certificate made by Paola Di Biase, and a silver tower handmade by Pasquale Imbastaro. The Mayor, The Deputy Mayor Piero Ottobrini, and the Culture Assessor Carmine Ficca, spoke of their desire to make the award a yearly institution. 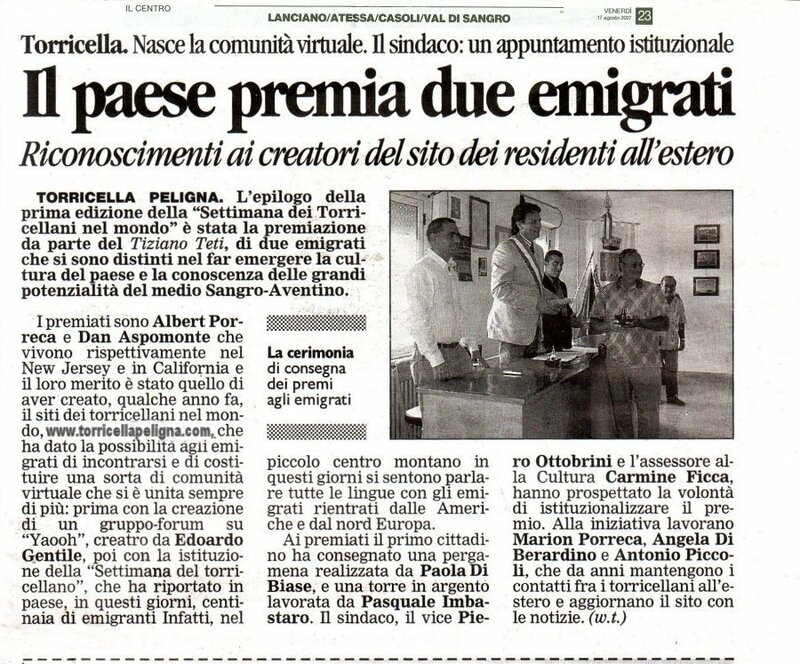 Others who contributed to the work include Marion Porreca, Angela Di Berardino, and Antonio Piccoli, who for years have maintained contacts with Torricellans abroad, and they update the site with news. 1. In the photo from left to right: Vice Mayor Piero Ottobrini, Mayor Tiziano Teti, Councilmember Carmine Ficca in charge of cultural affairs, Albert Porreca, one of the two award recipients, and Antonio Piccoli. Dan Aspromonte, the other recipient, was detained in California and was unable to attend the award ceremony. During the event the Mayor telephoned Dan to thank him personally. Due to the time difference, he was unable to reach him, but he left him a message of thanks. Dan subsequently responded with a letter to the citizens of the town. To read the letter, click here. 2. 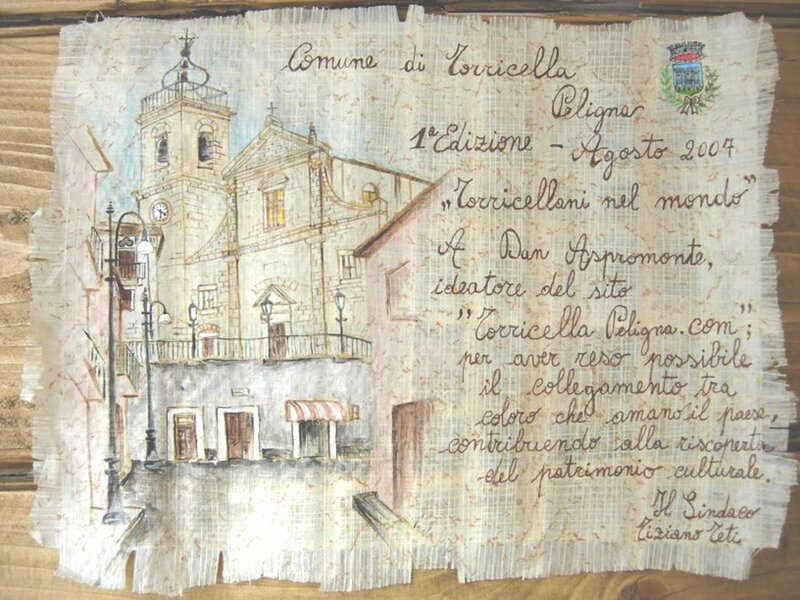 Brief News from Torricella - August 2007, click here.